In April 2015, a devastating earthquake struck Nepal. Hundreds of thousands of lives were shattered and nothing was unaffected: businesses, schools and infrastructure were destroyed, entire villages were flattened, and more than three million people were left homeless. The destruction and damage of schools and thousands of classrooms also meant that children could not return to school, putting their education and futures in jeopardy. 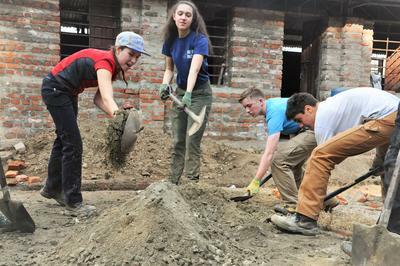 After the earthquake, volunteers began responding to the call to support Nepal, and Projects Abroad launched the Disaster Relief Project in June 2015. The primary goal of the project was to rebuild classrooms so that children could resume their education in a safe environment. We are extremely proud to say that with the help of our volunteers we achieved this goal in just 20 months! The impact that our volunteers made in Nepal over this period of time cannot be summed up in just a few words. Read our detailed Disaster Relief Report to learn what the project and our volunteers achieved. The situation in Nepal is no longer critical and when the project achieved what it set out to do, it was closed. As we have done in many countries, we have opened a General Building Project. By joining this project, you can help the schools still in need of support.